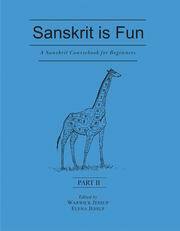 The first group of books entitled Sanskrit is Fun (Parts I-III) introduce the learners to the Devanagari alphabets, grouping the letters according to their place of articulation, called ‘Family’, which comprises both the vowels and consonants. Learners are first taught how to draw the letters. Learning and teaching is also helped by the humorous presentation of the letters in the form of animals figures. The next step is to add vowel to the consonants, and then to teach joint (compound) consonants. Finally words and sentences are formed. Elena Jessup Sanskrit teacher with 16 years' experience educating children and adults of all ages. Have designed systematic and creative Sanskrit language courses, textbooks, and materials. Interested in fostering connections between the East and West, especially any new initiatives in this area. Textbook writing, translating, language teaching (Sanskrit), academic writing skills, special needs, alternative educational strategies, graphic novel writing.